ARRA News Service: Adios, California? by Paul Jacob, Contributing Author: Californians account for more than one of every ten Americans. Three years ago, an initiative sought to split the mega-state up. Had that measure succeeded, the U.S. Congress would have decided whether to permit the Golden State to become six separate states — with ten more U.S. Senators. 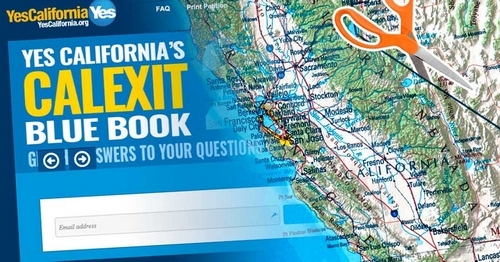 Now, a group called “Yes California” is petitioning for a 2018 ballot measure on leaving these United States altogether: Secession. “California could do more good as an independent country than it is able to do as just a U.S. state,” says its website. Supporters argued in a recent Washington Post feature that California “subsidizes other states at a loss.” Indeed, it’s one of 14 states that get less money back from the federal government than paid in taxes. And there’s Trump. Opposition to the president is palpable. California provided Hillary Clinton with a 4.3 million popular vote margin over Republican Donald Trump, 1.5 million more than her national margin. Nationally, for partisan reasons, Republicans may cheer it, while Democrats shudder. And they are. Already 21 of the 23 northernmost counties have made declarations to form the State of Jefferson. Let Californians decide . . . county by county. * Note that Trump won by a landslide in the counties that would comprise Jefferson, our would-be 51st state. Tags: Paul Jacob, Common Sense, Adios, California? To share or post to your site, click on "Post Link". Please mention / link to the ARRA News Service. and "Like" Facebook Page - Thanks!